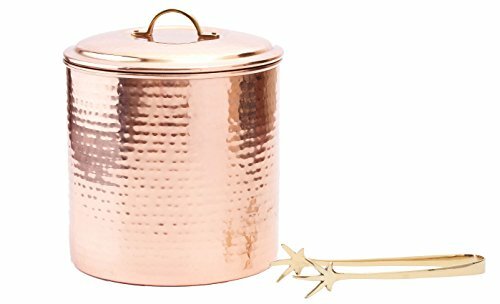 Our copper-plated ice bucket's simple, classic design will add a touch of class to any bar. Dressed to impress with its hand-hammered finish, its 3 qt. Capacity keeps plenty of ice on hand, while the removable liner with draining plate keeps your ice cold and dry. Exterior is coated with a Lacquered finish for tarnish resistance. you do not need to remove lacquer in order to use this ice bucket. ice bucket dimensions: 7” x 7” x 8.25” hand wash only with a damp cloth. A mild dish detergent solution may be used for cleaning. After washing, hand dry thoroughly. do not soak in water. Not dish washer safe. Removable liner with draining plate helps keep ice cold and dry. Generous 3 Qt. capacity for plenty of ice!